Millie. There are just times I can't get outside for a run. Millie is always there on those days, whether I sneak a few miles in while my girls watch a movie or when I don't have time to run until way past dark. My Garmin. When I do run outside, my Garmin is a must-have. Even though I sometimes go my entire run without looking at it, I love that I always know how far and how fast I ran once I'm finished. My PureFlow shoes. After being a tried and true Saucony Ride wearer from the beginning, I gave the new Brooks PureFlow a chance. And I love them. I have four pairs. I still include my Sauconys in the rotation and have recently added a pair of Nike Free 2.0 to my collection, but the PureFlow are my favorites. My Costco tanks. Last summer, I bought three tanks from Costco. They are my favorite shirts to wear running. Every time I go to Costco, I look to see if they have them again. Still holding out hope. My RoadID. I wear it EVERY time I run outside. It gives me peace of mind. 2Toms SportShield. I like it better than Glide for my blister and chafe prone spots. My headbands. The one thing that can drive me just about crazy during a run is my hair if it isn't being held in place. Lip balm. Fresh mint with SPF15 from Gap is one of my favorites. I put it on before every run, even the ones on Millie. SmartWool socks. I once swore by WrightSocks, but they were never completely blister-free. I have yet to get a blister wearing my SmartWool. And they have different thicknesses, so they are even great when it's hot! Vanilla Honey Stinger Waffles. Holy yum. Better than any gel or chomp I've tried. And I've tried a lot. I have to keep the waffles upstairs with my running gear or I would end up eating them as snacks. I am too lazy to put link to all my favorites, but you can search for most of them and easily find them online. Have a great weekend runnerds! I've heard about the RoadID before. Have a lot of runners recommended to you? The Vanilla Honey Stinger Waffles looks so good. 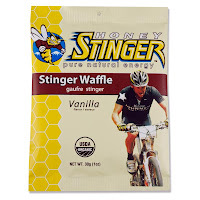 I was checking out Honey Stingers products the other day. They have pretty good ingredients. I love SmartWool but had only used them in the winter. I didn't realize they had summer ones too. I have issues with skinny ankles so I always have sock slippage but SmartWool never slips. Ever. I am loving Brooks right now too - I've got the Launch! 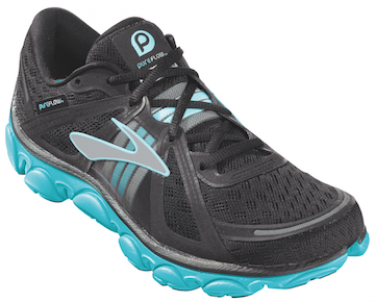 I'm a saucony wearer to, so want to try the Brooks Pureflow. Thanks for putting all your things that you must have. Great list.